How do I hang a shade with a 10mm hole? Use one of our 10mm galleries as shown below. The hook comes out the top and the brass all thread goes through the 10mm hole in your shade. You then choose the colour flex you want to hang down to your cord grip lampholder and up through the hook to your ceiling plate. You can use a cord grip if your light weighs less than 2kg as this is the weight tolerance of the flex just ask us to switch it for you at the checkout. 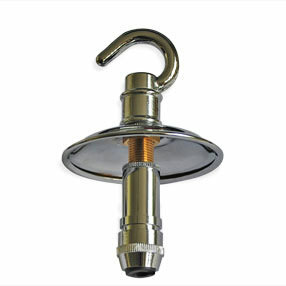 To attach to the ceiling use one of our ceiling hooks with some large link chain between. Then just choose a bulb. How do I hang a shade with a rim? How do I hang a rimless shade?